This book presents a thorough explanation of the notation of summation, some unusual material on inequalities, an extended treatment of mathematical induction, and basic probability theory (including the explanation that all gambling systems must fail). It also contains a complete treatment of vector algebra (including the dot and cross product). 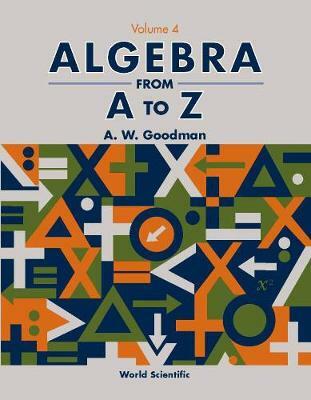 This is usually reserved for a calculus course, but is properly algebra, and so belongs in any algebra book.Since this book deals with algebra from A to Z, it starts at the beginning with the arithmetic of the counting numbers and their extensions, i.e. the negative numbers and the rational numbers. However, these very elementary items are treated from an advanced point of view. The teacher should assign the first three chapters as outside reading, using only one day per chapter for classroom discussion.The remaining chapters cover all of the usual topics in college algebra, but they contain many unusual items not found in the standard college algebra course. As an example, the circle notation for a composite function is now standard material, but this book explains just why that notation is needed.The book concludes with a presentation of the Peano Axioms. This advanced topic should be available to all mathematics students, whether they are first year algebra students or are working for a PhD degree.